MORRIS TWP. — Ryan Curran didn’t mean to be an ungracious host but he and his Delbarton teammates are tired of losing to opponents no matter where they came from — even from China. Curran knocked down a 3-point shot at the buzzer to lead Delbarton to a 59-58 victory over Nanyang Paradigm, a high school team from Shanghai, China, on Sunday in an international scrimmage. 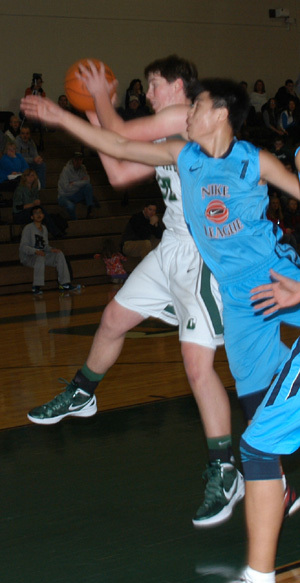 Curran led the Green Wave with 29 points. The team from China was on a 12-day tour which included stops in Chicago, Buffalo and Washington, D.C. They concluded their tour with Sunday’s game and is reportedly attending today’s NBA contest between the New York Knicks and the Orlando Magic before heading back to the Orient. Although the scrimmage didn’t count towards their 1-8 record, the young Delbarton squad rallied to earn the victory and is hoping the triumph will lead to success on the court in the coming weeks. Billy Carroll defends his Chinese opponent during Sunday’s game. The contest was considered to be the first time that the Delbarton boys basketball team has ever faced an international opponent. The Chinese team was supposed to play another New Jersey private school which backed out in the last minute and Delbarton stepped up to take its place. A Morris County team had not hosted a high school basketball team from overseas since Kinnelon hosted an Australian squad a few years ago. The tour came about when Joseph Cooley, who lives in Shanghai and runs the China operation for an American company that makes automotive leather, struck up a relationship with the school. 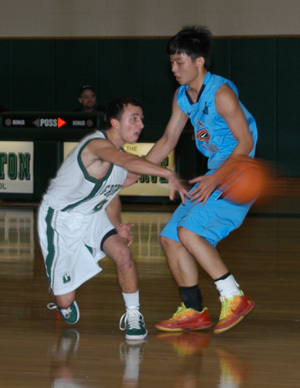 Delbarton rallied from behind to earn a victory against its Chinese opponent on Sunday. It took a year and a half to arrange the tour which also included stops to play high school teams in Erie and Williamsport. The city of Shanghai is basketball crazy. It is the home of Yao Ming, the most famous of all Chinese basketball players. There are reportedly 200 million registered basketball players in the country. Nanyang Paradigm is traditionally among the top high school teams in China. Although the Shanghai team finished its tour at 1-4, the trip was considered a huge success. Cooley has Delbarton ties. His wife Rosemary was once an art teacher at the school. His sons Sean and Brian both attended and played lacrosse at Delbarton. All the players on the Chinese team understand English and speak it to varying degrees of success although the tour was equipped with an interpreter. A few of the players stayed with Delbarton families including one with the Currans. Although it was a scrimmage, Delbarton approached it as a game with only one small change in their usual gameplan, Whalen wanted all of his players to compete and share in the experience. The China team had height but wasn’t quite as physical as the average area high school team. They did have a couple of shooters that were impressive from the perimeter including leading scorer Ming Shenglin who had 21 points. 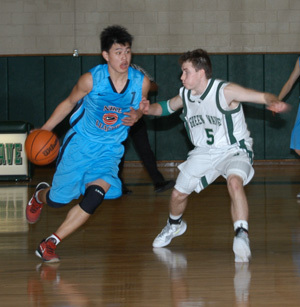 The Shanghai team led 56-50 with three minutes left, but Delbarton rallied back with a 6-point run to tie the game. Curran had a 3-point play and Brian Hardin had a layup to help the run. A layup by Liu Zhiang gave the Shanghai team a 58-56 with under a minute. The teams exchanged possessions and Delbarton called a timeout with 5.8 seconds left to set up a final shot. The Green Wave is hoping its scrimmage triumph will give them a lift after a 1-8 start. He knocked down the perimeter shot at the buzzer and gave the Green Wave a reason to celebrate and even though it won’t count in their record books, it might provide a little confidence needed to gain some future victories.